Tullytown, Pennsylvania, February 12, 2019 – Christ the King Orthodox Church, a western rite parish of the Russian Orthodox Church Outside of Russia, in Tullytown, Pennsylvania, half an hour northeast of Philadelphia, is home to two myrrh-streaming icons. 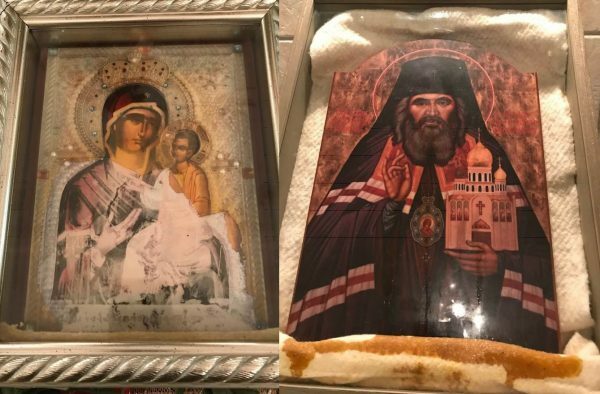 One is a print copy of the wonderworking Hawaiian Iveron Icon of the Mother of God, and the other a print icon of St. John Maximovitch. The parish’s site links to a blog post that tells the story of the myrhh-streaming icon of the Mother of God. The parish was blessed with a visit from the Hawaiian Iveron Icon on October 15, 2011, with guests arriving from all over Pennsylvania and New Jersey. The owner of the icon, Reader Nectarios, offered the parish a copy of his icon at the end of the visit, which was blessed on the Hawaiian icon and then prominently placed in the church. It also began to stream myrrh soon thereafter. The Tullytown icon has a different scent than the Hawaiian icon and does not stream as much myrrh, though it gives off enough to have damaged the plastic covering on the icon, which had to be cut away so people would not cut themselves while venerating the icon. The parish is also home to a myrrh-streaming icon of St. John the Wonderworker which, as parish rector Archpriest Bernard Andracchio told OrthoChristian, has been streaming since 2013. It is a copy icon that streams occasionally. The icon has been seen by Archpriest Mark Rowe, the Vicar General of ROCOR Western Rite parishes, and many other clergy.